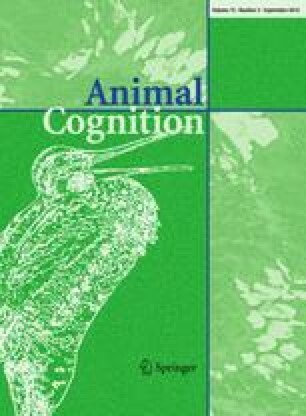 Are head cues necessary for goats (Capra hircus) in recognising group members? In this study, we investigated whether goats can distinguish a member of their own group from one belonging to a different group even when the head of the goat in question cannot be seen. In the experiment, a total of 45 adult female goats (walkers) were trained to walk along a passageway at the end of which they learnt to expect food (trial run). Walking down this corridor, they passed another adult female goat (stimulus goat) whose trunk and hind legs alone were visible. Using 19 individuals, ten pairs of stimulus goats consisting of one goat from the walker's group and one from a different group were matched in terms of body size, constitution, colour and coat length. In addition, the stimulus goat from the same group as the walker had to be higher ranking than the latter to avoid being attacked. The walkers completed two, four or six trial runs depending on the number of pairs suitable for a given walker. The walker’s exploratory behaviour (observing and sniffing at the stimulus goat) was recorded. Data from 109 trial runs were analysed using generalised linear mixed-effects models with crossed random effects. On average, the walker spent a total of 8.7 s exploring the stimulus goat visually and olfactorily if the latter was from a different group and only about half as long (4.2 s) if it was from her own group. In particular, the time a walker spent observing a stimulus goat whilst approaching the latter was significantly longer if the stimulus goat belonged to a different group than to her own (2.5 s as opposed to 1.4 s). Moreover, a stimulus goat from a different group was sniffed at significantly longer (4.6 s) than one from the same group (1.9 s). Results suggest that goats can easily discriminate between members of their own group and those of a different group even when the latter’s heads are hidden. Olfactory and visual cues are probably important for identifying group members. Our special thanks go to Marc Wymann, Gallus Jöhl and Vid Vidovic for caring for the goats and to Lorenz Gygax for his in-depth statistical advice. This project was financed by the Swiss Federal Veterinary Office (Project No. 2.05.05).